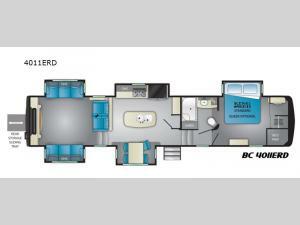 You will make plenty of memories with your family when you camp in this five-slide Big Country 4011 ERD fifth wheel. You can easily sleep up to six people in this model, plus you can do a little entertaining in the rear living area. Here you will find two sofa slide outs and a set of theater seats. Meal prep is easy in this kitchen, where you will find an island with extra counter space and a double sink. You can enjoy your meals at the free-standing dinette and in the evening plan to play a card game or two here. When you are ready to turn in for the night, then retreat to the front bedroom where you will find a king bed plus a large wardrobe and a wardrobe that has been prepped for a washer and dryer.